Asparagus is not really a popular vegetable. However the reason does not lie with the vegetable itself. It is because most of us do not know how to get the best out of it and turn it into a delightful salad. 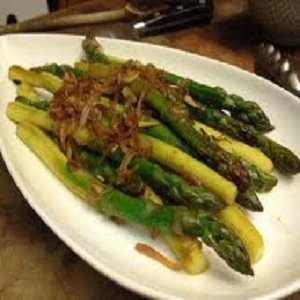 The recipe we have here uses Asparagus, garlic and shallots in a dressing of olive oil and lemon juice to form a delicacy you are bound to savor. The recipe is a must try if you have the knack for trying new things. The recipe is easy to master and has the potential to become your signature dish. Plan the recipe three hours ahead of the meal because the flavors need to blend together well. Our step by step guide has everything below. Preparation time: 3 hours 30 minutes (Do not freak out. This includes three hours refrigeration time and that is optional). Put the oven on a pre-heat of 230C. Put the asparagus in an over proof dish. Pour 2 tablespoon olive oil on them and spread it all over using your fingers to coat the vegetables. Roast them for around twenty minutes or until they appear soft and brownish. While the asparagus are cooking, give attention to the garlic and shallots. Peel them and cut them into quarters. Heat the remaining oil in a wok pan. Add the shallots and garlic to it. Fry until the vegetables turn golden. Add 4 tablespoon water and let them simmer for around fifteen minutes or when they soften. Increase the heat and boil enough to make half the liquid evaporate. Add the vinegar now and bring the liquid to boil again. Pour this hot dressing over the roasted asparagus. Season the salad with salt and freshly ground pepper. Sprinkle the herbs all over. Now you can choose to serve warm or wait for the flavors to blend in the refrigerator for a couple of hours.